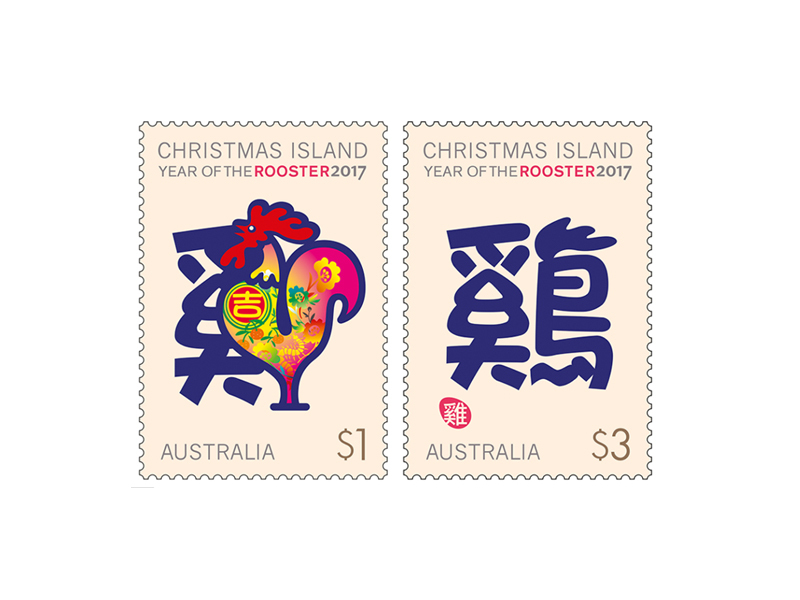 According to the Chinese Lunar Calendar, the Year of the Rooster runs between 28 January 2017 and 15 February 2018. 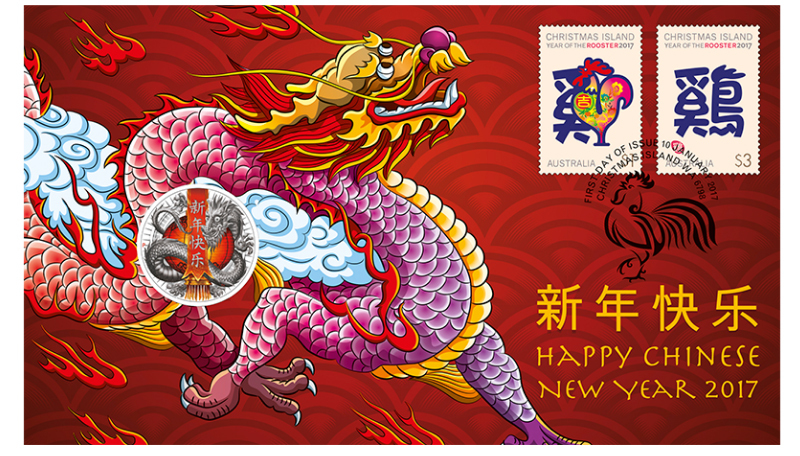 For Chinese people around the world, Lunar New Year is not only a time of renewal, but also a time for family dinners, exchanging gifts and enjoying public festivals and celebrations. 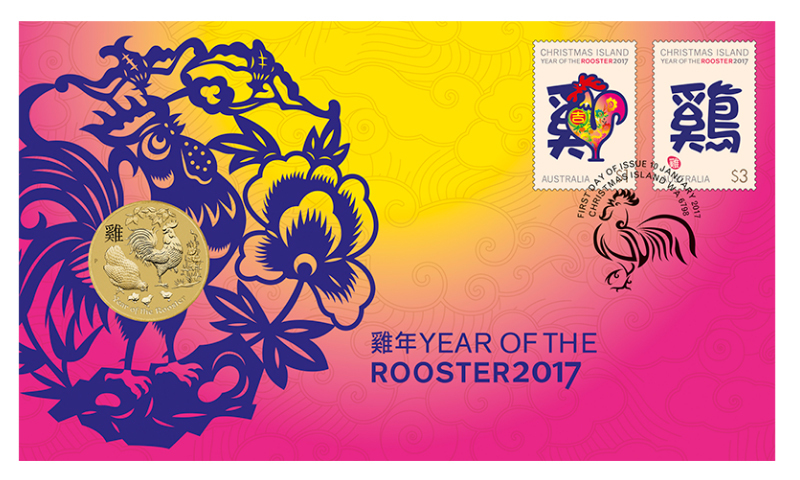 The flamboyant Rooster is the tenth sign of the Chinese Zodiac. 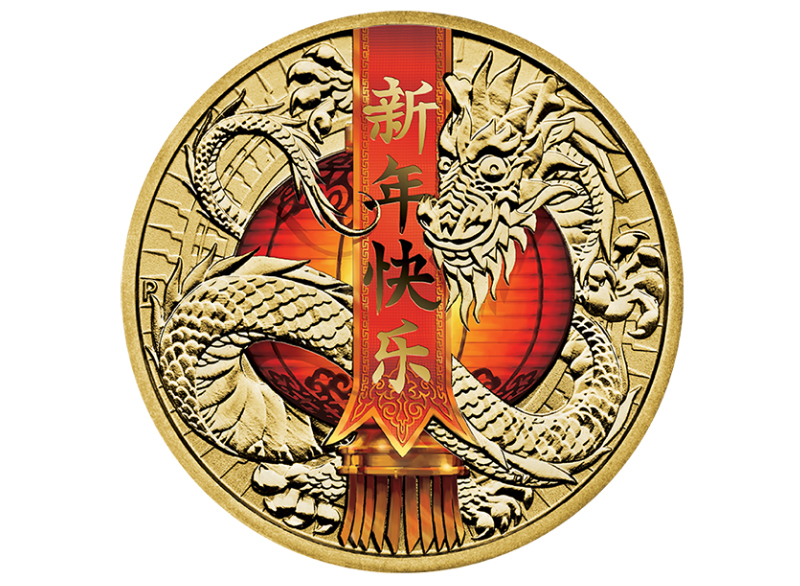 The Rooster is considered persistent and reliable, especially as they are the announcers of the new dawn. 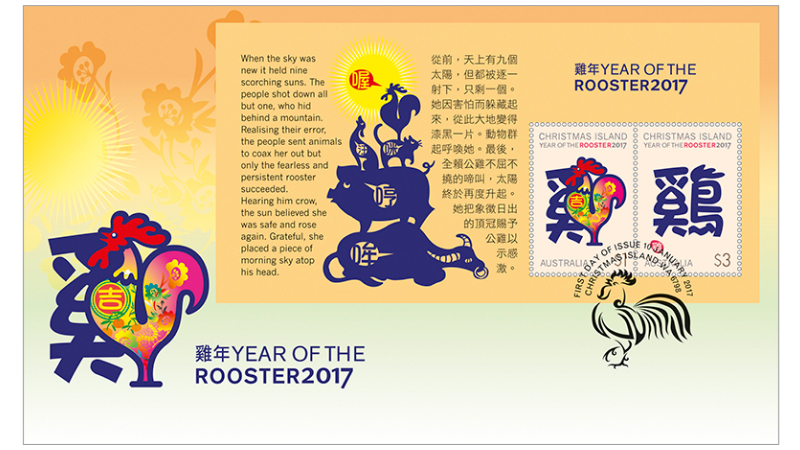 Plus, according to Chinese legend, it was the Rooster that coaxed a hiding sun back into the sky and returned warmth to the world. 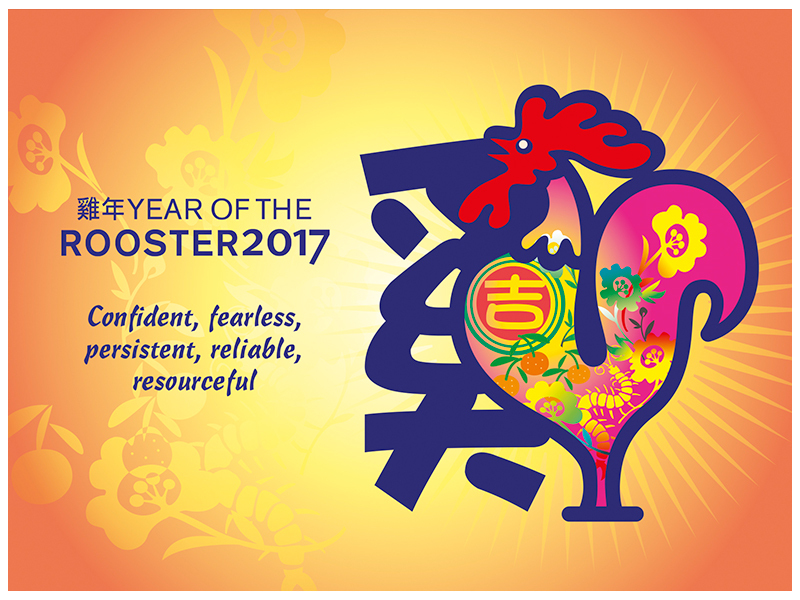 Those born under the Rooster sign are often confident, observant, resourceful and courageous. 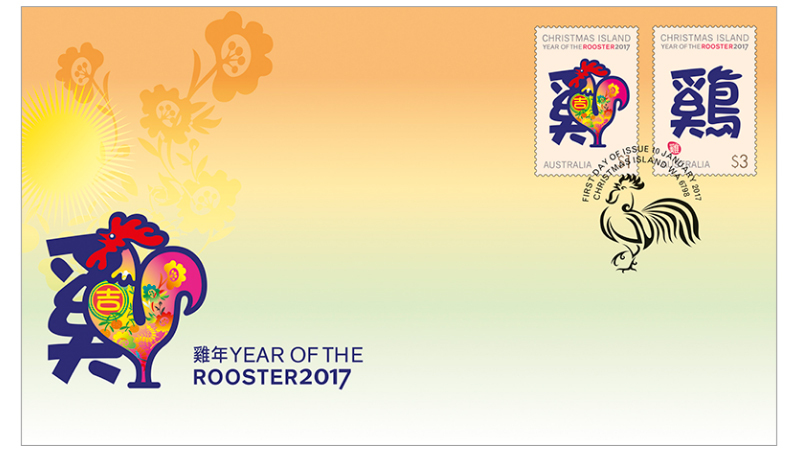 The honest and hard-working Rooster likes to be surrounded by others. 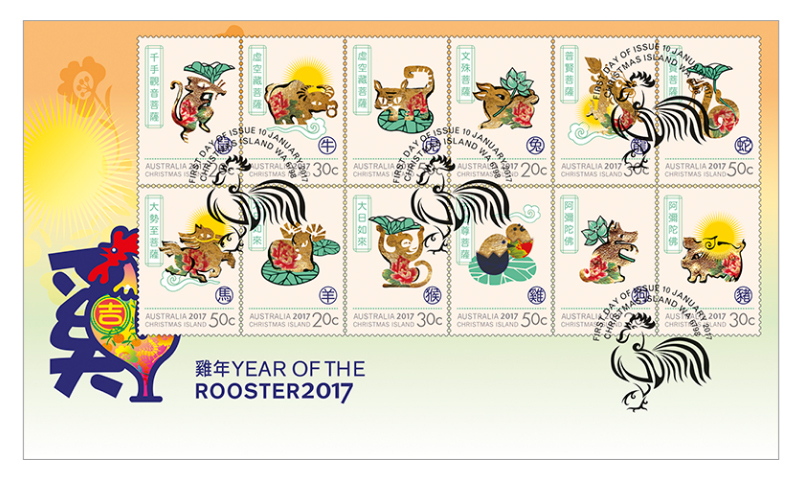 Britney Spears, Cate Blanchett and former Australian Prime Minister Kevin Rudd were all born in the Year of the Rooster. 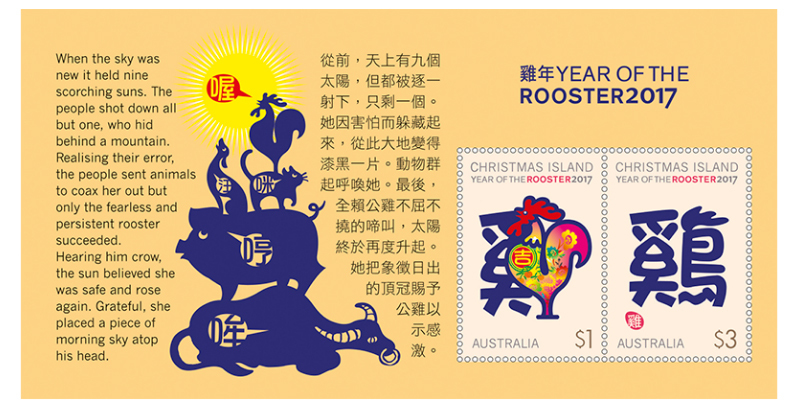 The stamp and coin cover is highly collectable, featuring a pictorial envelope with the two stamps from the Christmas Island Year of the Rooster 2017 stamp issue and a coin from the Perth Mint. 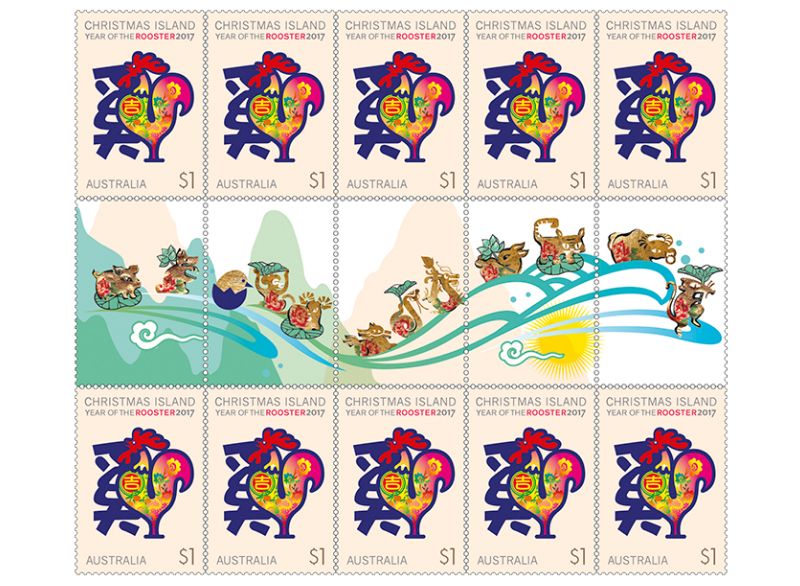 The stamps are postmarked - First day of issue | 10 January 2017 | Christmas Island WA 6798. 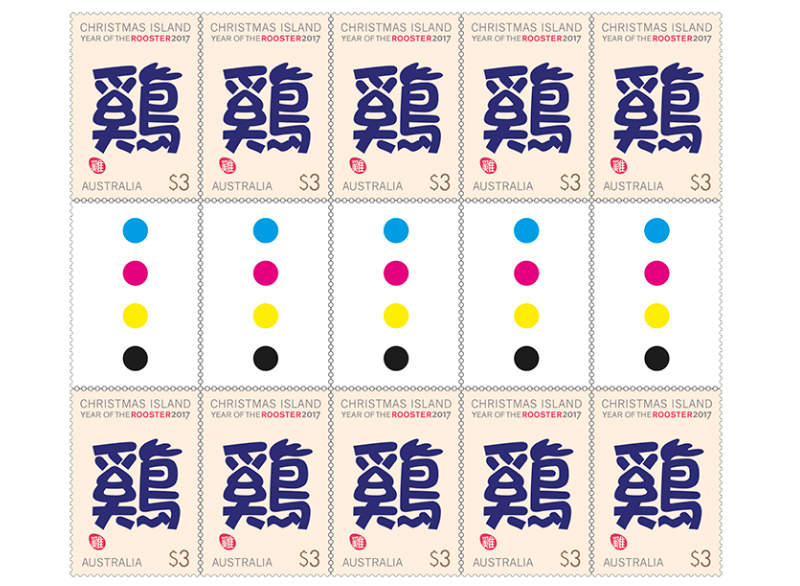 PNC 2016 Issue 02, limited to 8,888. 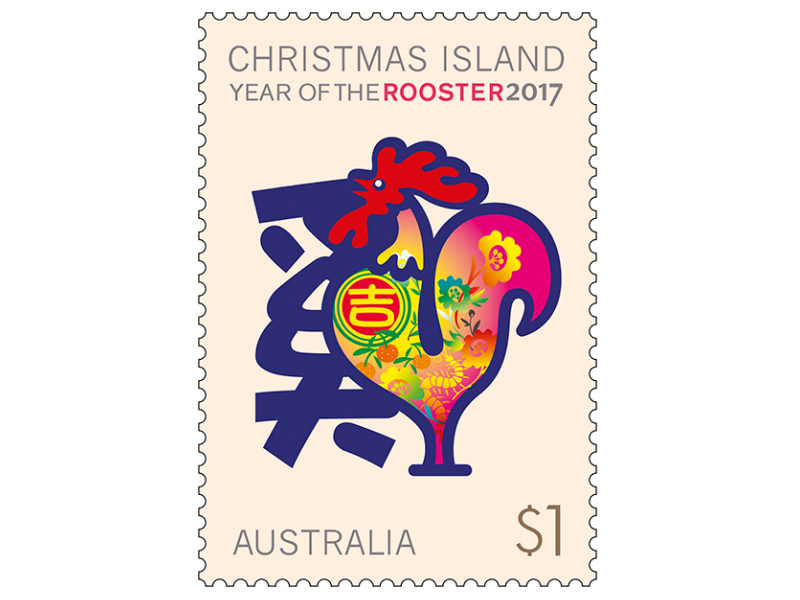 The stamp and coin cover featuring a pictorial envelope with the two stamps from the Christmas Island Year of the Rooster 2017 stamp issue and a coin from the Perth Mint. 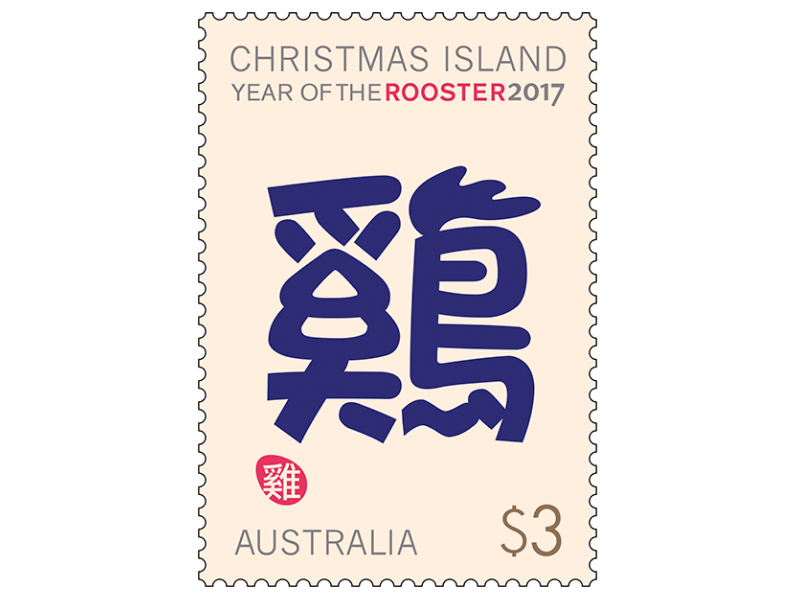 The stamps are postmarked - First day of issue | 10 January 2017 | Christmas Island WA 6798. 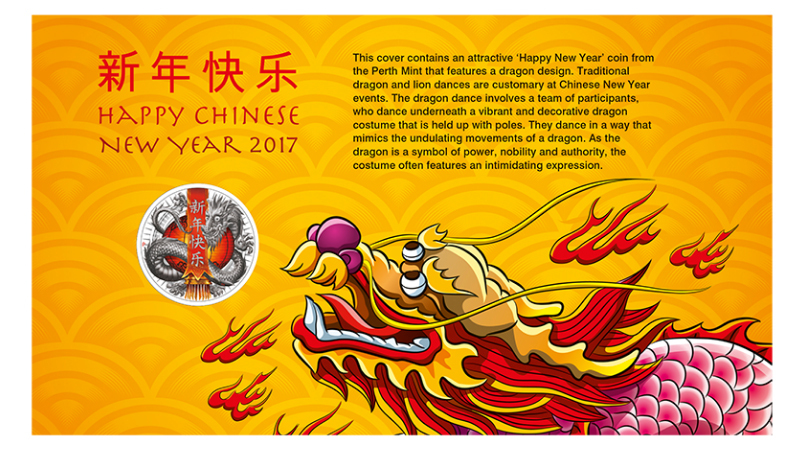 PNC 2016 Issue 01, limited to 11,000.